Note: This text does not come with the audio cd. To order the 3 audio CD set, use ISBN 013403306X. To order the audio CD packaged with this text, use ISBN 0134204816. Here is a clear, systematic introduction to the fundamentals of linguistic phonetics with a total learning package designed to help students become proficient in phonetics and phonetic transcription. 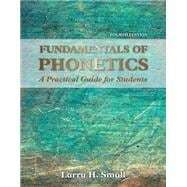 Fundamentals of Phonetics by Larry Small provides speech and hearing students with a good understanding of phonetics principles through practice. The text uses in-text exercises and supplemental audio recordings to teach the practical skills necessary to successfully perform phonetic transcription of individuals using the International Phonetic Alphabet (IPA). Students learn about the transcription of consonants and vowels, connected speech, and individuals with speech sound disorders. A chapter on speech acoustics introduces spectrograms and the acoustic characteristics of speech sounds. Students also learn how to transcribe individuals who display regional and ethnic dialectal variation of speech, including those who have learned to speak English as a second language. Throughout the text are included chapter objectives, learning exercises, in-class and take-home assignments, online resources, and study questions that will help students learn, process, and practice the material presented in the text. Larry H. Small received both a B.S. in Speech Pathology and Audiology (1977), and an M.A. in Audiology (1977) from Kent State University. He received his Ph.D. in Speech and Hearing Science from Ohio University in 1984. He worked as a clinical audiologist at the University of Nebraska Medical Center in Omaha from 1978 – 1980. Dr. Small joined the faculty of Bowling Green State University (BGSU) in 1984, and remained on the faculty for twenty-four years, prior to his retirement in 2008 when he was named Associate Professor Emeritus. While at BGSU, he served as the Director of the University Honors Program (1991 – 1996). He was also Chair of the Department of Communication Disorders from 2003-2007. Dr. Small was on the Executive Board of the Council of Academic Programs in Communication Sciences and Disorders (CAPCSD) from 2007-2011, serving as President from 2009-2010. He began teaching undergraduate and AuD courses at Ohio State University (OSU) in 2008. For the past thirty years, he has taught courses at the undergraduate and graduate levels in phonetics, hearing science, diagnostic audiology and aural rehabilitation, both at BGSU and OSU. He has authored or co-authored numerous presentations and publications. Dr. Small was named an ASHA Fellow in 2014.